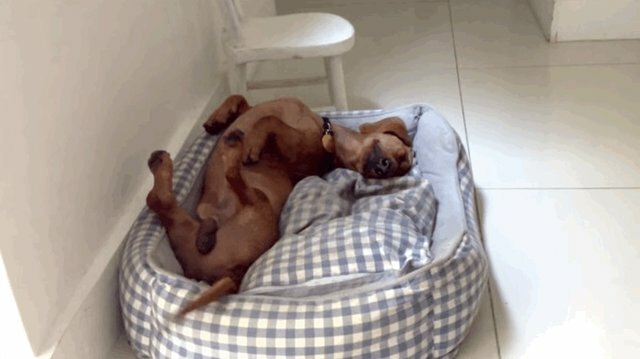 Meet Frank, one of the world's happiest little dachshunds. He's so full of excitement for life, in fact, that he cannot keep his tail from wagging even when he's fast asleep. But things weren't always so good for this clearly delighted dog. "When we got him, he was afraid of shadows, glimmerings, peed everything (including himself), no tail wagging and fearful. By the way, until today he runs for his life whenever he sees a broom...," writes Rafael. "Now, see him enjoying his dream so much that he even wags his tail and realise that we saved a life, bringing him happiness, is moving."